Annie Bloom’s welcomes local feminist horror author Gretchen Van Lente to read from her story collection, She-Thing and Other Righteous Tales. Wear your Halloween costume to the reading! 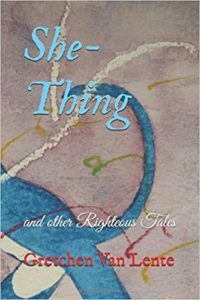 She-Thing offers fanciful storytelling proof that there is justice for every slight you ever endured, in an assortment of stories set in the parallel universe that resides within and without you, parables of the heart that beat closer than the memory of your worst enemy. That is where your not-so-imaginary monsters are born–the primordial that prevails within. Knowing we all wear the bone of a tail, this compelling new short story collection will transport your imagination into this fraught space.